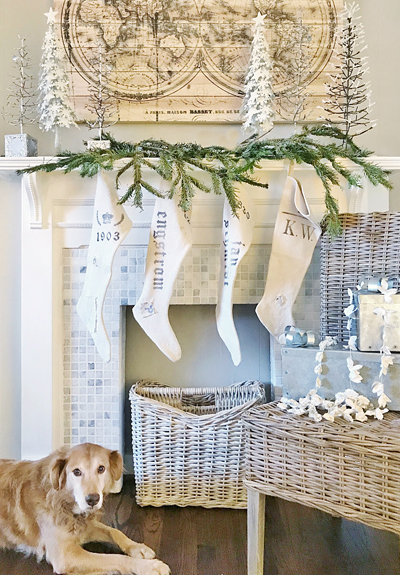 Stop by for a Christmas home tour showcasing the homes of over ten farmhouse bloggers! 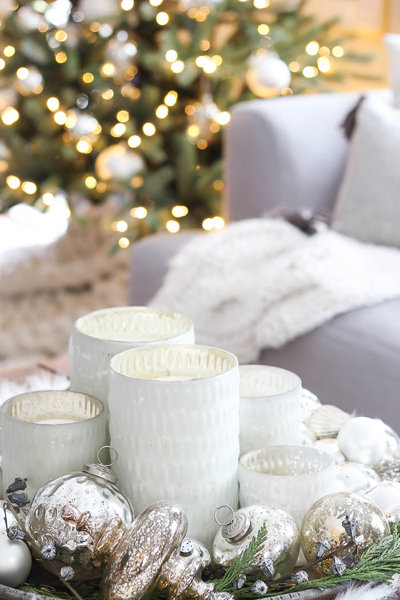 Get inspired this year with beautiful & unique ideas to decorate your home for Christmas! If this is your first time visiting us at Boxwood Avenue, welcome! I am so glad you’re here! My name is Chloe. I live on a cattle ranch in Northern California. I was uprooted from my city life a few years ago and transplanted to a town of 99. Since moving, I have found joy in living a bit more simply, and a lot more slowly than how I lived in the city. I hope you’ll subscribe to my blog so we can stay in touch! Today I want to share our home with you all dressed up for Christmas! Our entryway is painted Midnight Stroll by Clark & Kensington, which helps make our vintage gold mirror pop! I love the way the faux greenery drapes over the mirror, almost as if it is napping. While I love fresh greens, this faux greenery from Michaels is very realistic! I always seem to use trays to organize our entryway, these vintage zinc trays from my shop are one of my favorite things this year! I have a few left if you’re interested! I also used a bit of the same greenery in our kitchen. I keep this wintery equestrian print here year round, but it seems so festive this time of year! I draped some vintage French bells over the top and added some greenery to our hood! Our dining room table was the perfect place to turn to fresh greenery from some of our pine trees out back! One of my favorite ways to decorate is to use what nature provides us! In the winter that means heaps of pinecones and evergreen clippings! My sister helped me find a small bushy tree to add to our dining room. We used twinkle lights on the tree, which provides the most festive feeling during dinnertime! The long shelf in our dining room is so fun to decorate. The shelf is actually made of a fence board which I stole from our corrals. When my husband came home to his corrals missing a piece, he was less than thrilled, but the shelf was worth the explaining! I love decorating this shelf with vintage items from different flea markets! This vintage bottle drying rack was the perfect place to hang our advent calendar! If you’d like to make your own DIY advent calendar using my free printable tags, just click the photo below! You might have realized that I love vintage French decor! I found this old Champagne crate while shopping in High Point, NC. It was worth the effort to bring home, it has become one of my favorite things! I have drilled holes in the bottom of it where I usually have old castor wheels. For Christmas I removed the wheels and have decided to use it to hold our Christmas tree! The crate is wide enough that our Christmas tree stand fits inside, however, if you’ve found a bucket or crate that isn’t wide enough to hold your Christmas tree stand, try using a pitcher or glass milk jug - that usually works well for me! Before you go, I’d like to welcome you into our Christmas guest bedroom! This room used to have purple carpet and a pink bathroom! Since we moved in, we removed the carpet and added a fresh coat of paint, crown molding, and new flooring! I found the vintage dresser in the storage shed behind our house. I love the detail of the woodwork and the marble top! To add a little Christmas to this room I updated the pillows on the bed with something a bit more festive, then place a tiny evergreen tree in a vintage French pickling jar. Simple & festive! I hope you have enjoyed touring through our Christmas home! I’ll now send you to my friend Ella Claire’s home! I know you will love all of her beautiful ideas! Thanks so much for stopping by! 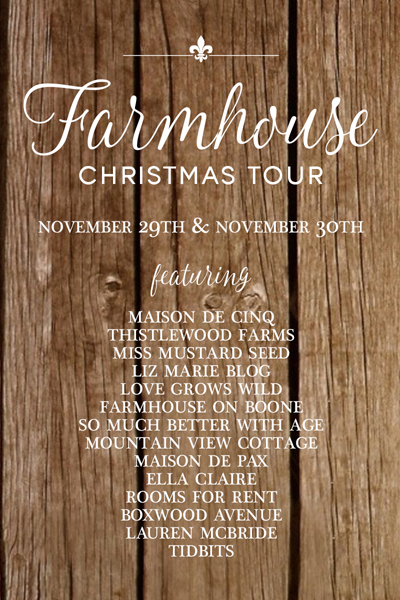 Have some fun touring everyone’s homes, and don’t forget to swing back by tomorrow to see them all!